This 2 day tour is ideal if time is short and you want to discover the remoteness of Scotland's far north, fabulous seascapes and, of course, those cheeky puffins! From Edinburgh we leave the city behind and head towards the Highlands. Soon there are fine views of Stirling Castle and the Wallace Monument, which commemorates William Wallace, the real Braveheart. We make a stop for morning coffee in Kilmahog before crossing from the Lowlands into the Highlands – a region that is steeped in history, stunning scenery and exciting adventures. Next it's on through bonnie Strathyre and Rob Roy MacGregor country to the sprawling Great Moor of Rannoch, one of the last truly wild places left in Europe. No matter the weather there is nothing that will prepare you for the beauty of Glen Coe. This famous valley resonates through Scottish history as a place of great significance. We will make a stop here so you can soak up the atmosphere of this special place for yourself. It's a short drive to Inverness, where we will spend the night. We leave Inverness to head across the Black Isle to the Cromarty Firth. A 27m (90') statue of the first Duke of Sutherland towers above the town of Golspie. The duke's agents were involved in the most notorious of the Highland Clearances in the 19th century. You'll learn more about this sad period of Scotland's history later in the tour. 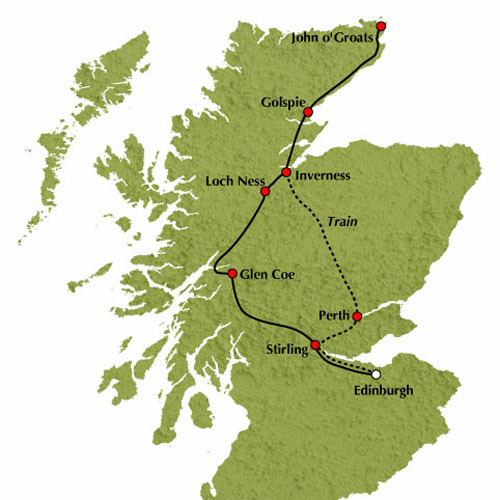 We will also stop in John O'Groats for that "I was there” photograph at the very tip of the British mainland. We then make our way to stunning Duncansby Head, for a stroll along the cliff-top path, rewarded with views of sea stacks and coastal views. Duncansby is renowned for its birdlife including guillemots, kittiwakes and, its most famous residents, puffins (until late July). From Duncansby, we turn southwards through Wick, where there will be a comfort stop, before we southwards to Inverness. After a short break in Inverness board the train for your scenic rail journey to either Edinburgh or Glasgow #. Please note that the train journey is unescorted and part of the journey may be in darkness. # If you wish to return to Glasgow please contact us before you make your reservation. A child discount of £10 applies to children aged 3 to 15 years inclusive. Once booked this package cannot be altered or cancelled. You have the option of returning to Glasgow rather than Edinburgh. If you would like to avail of this option please contact us prior to making your reservation.